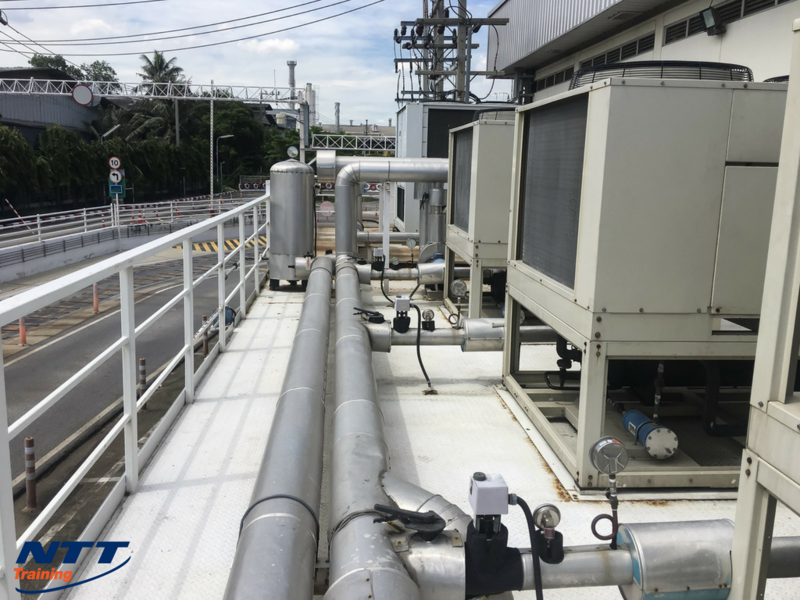 Chilled water systems work on the same principle as other air conditioning systems that use standard refrigerant, but are mainly found in industrial settings because it costs less to use water for cooling. It’s also more efficient to run water pipes over a large commercial area, with the pipes distributing the water to evaporator coils in air handlers, than it would be to run refrigerant lines. Cost effective in industrial settings, chillers are almost never used in homes. Despite their cost-saving advantages, these systems are nevertheless complex and require well-trained employees to maintain them. Chillers have many uses, from bringing the temperature down in an ice hockey rink, to cooling large buildings where low temperatures are essential, such as food processing plants and petrochemical factories. Chiller designs differ, depending on the building or industry they are installed in, and the temperatures required. But the basic concept is that the chiller removes heat from a heat source — such as the building’s environment or air. Heat moves from a warmer source to a colder source, so with a chiller, the heat from the building’s air is transferred to what is called a fluid circuit, then to the refrigeration circuit, and then to a condenser where it is expelled. With air-cooled condensers, heat is expelled by blowing cool air across a condenser, then moving heat into the air. Water-cooled condensers circulate cool water or a water/glycol solution through lines in a condenser; then water moves heat to an external cooling apparatus, called a water-cooling tower. Low-pressure liquid/gas mix enters the evaporator. Heat from water or solution boils refrigerant, changing it from liquid to gas. Low pressure gas enters compressor; is compressed into high-pressure gas. High-pressure gas enters condenser; ambient air or condenser water takes out heat, cools it to high-pressure liquid. High-pressure liquid flows to evaporator, starting refrigeration cycle over. There are two basic types of chiller: compression and absorption. Compression types use various types of compressors; absorption types use natural gas or a chemical process to heat the refrigerant, then employ another chemical process to absorb heat. Chillers represent a substantial financial investment on the part of the business owner. Employers can protect the equipment by ensuring that all operators are well trained in maintenance and troubleshooting. In addition to instruction on preventative maintenance and troubleshooting of chillers, employee training should include the basics of thermodynamics and heat transfer. The payback for offering comprehensive training to all employees involved with chiller operation will be the assurance that they know how to correct potential problems before they turn into expensive repairs that require equipment downtime and lost revenue. Chillers are generally an operation’s single biggest energy user. Efficient operation can be best assured by adopting a regular schedule of comprehensive maintenance, involving not only predictive maintenance (infrared thermography, vibration analysis, and rotor bar testing are some tools owners typically employ), but also a comprehensive preventive maintenance plan. Your well-trained employees can make significant contributions to developing this plan, as well as ensuring that it is implemented and followed rigorously. The presence of anhydrous ammonia, which is often used in absorption-type chilled water systems, or any refrigerant, calls for workers to be well trained in safety procedures. Injuries and deaths are common when accidents occur involving this substance in particular. Further, there are some risks involved with handling any kind of HVAC equipment, so employees need to be aware of them, and be well schooled in the HVAC industry’s recommendations for avoiding burns, electric shock and other injuries. To ensure your employees are well prepared to perform preventative maintenance and troubleshooting on chilled water systems, contact NTT Inc. for more information on our three-day seminar on Chillers: Operation and Maintenance of Chilled Water Systems.